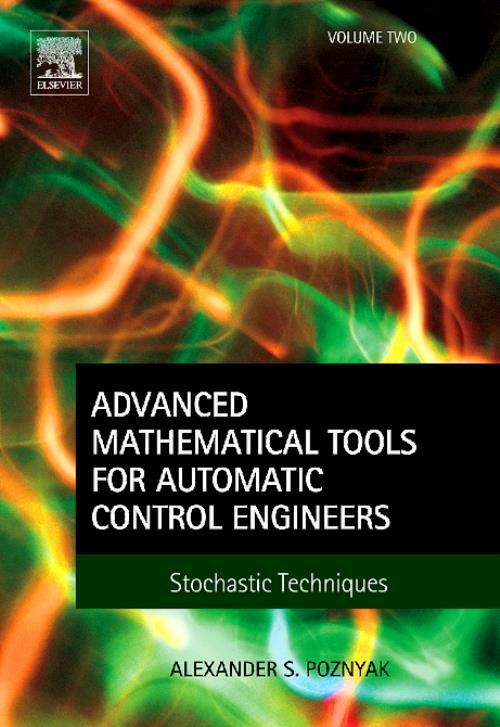 Advanced Mathematical Tools for Automatic Control Engineers, Volume 2: Stochastic Techniques provides comprehensive discussions on statistical tools for control engineers. The book is divided into four main parts. Part I discusses the fundamentals of probability theory, covering probability spaces, random variables, mathematical expectation, inequalities, and characteristic functions. Part II addresses discrete time processes, including the concepts of random sequences, martingales, and limit theorems. Part III covers continuous time stochastic processes, namely Markov processes, stochastic integrals, and stochastic differential equations. Part IV presents applications of stochastic techniques for dynamic models and filtering, prediction, and smoothing problems. It also discusses the stochastic approximation method and the robust stochastic maximum principle. Alexander S. Poznyak has published more than 200 papers in different international journals and 13 books including 2 for Elsevier. He is Fellow of IMA (Institute of Mathematics and Its Applications, Essex UK) and Associated Editor of Oxford-IMA Journal on Mathematical Control and Information. He was also Associated Editor of CDC, ACC and Member of Editorial Board of IEEE CSS. He is a member of the Evaluation Committee of SNI (Ministry of Science and Technology) responsible for Engineering Science and Technology Foundation in Mexico, and a member of Award Committee of Premium of Mexico on Science and Technology. In 2014 he was invited by the USA Government to serve as the member of NSF committee on "Neuro Sciences and Artificial Intelligence.